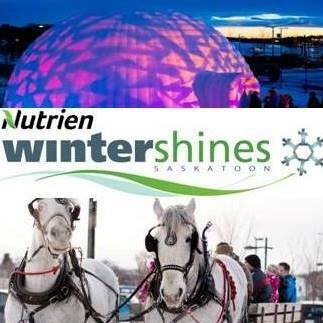 Nutrien WinterShines will take place January 26 to February 3, 2019. Giving life and meaning to our winter city, this community event is Saskatchewan's Premier Winter Festival. Events are headquartered at the Saskatoon Farmers’ Market for all ages with various interests in mind. Activities include Ice Carving and a Snow Park for children of all ages. A winter cuisine will tantalize the taste buds during the Soup Cook Offs, as well as local entertainment to fill the air with music. Other features include large outdoor igloo, pony rides, sleigh rides and more! Check out www.nutrienwintershines.ca for all 94+ event details!